A clean, sophisticated hotel in the heart of the South Bay Area, the Sheraton Sunnyvale Hotel offers a garden-like setting and refined accommodations near top Bay Area destinations. Both business and leisure travelers can enjoy easy drive times to downtown San Jose, Mountain View, Palo Alto and even San Francisco from this centrally located hotel. The surrounding area is home to dozens of major corporations, world-class shopping and excellent restaurants. 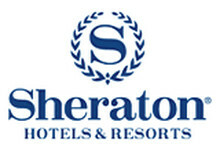 The Sheraton Sunnyvale Hotel aims to provide guests with a modern lodging experience. Guestrooms feature a warm, welcoming style and amenities like granite countertops, ergonomic workstations, plush linens, 32-inch LCD televisions, dual-line telephones and on-demand movies. This Silicon Valley luxury hotel also boasts an Olympic-sized swimming pool, a whirlpool, beautiful landscaped garden areas and a 24-hour fitness facility. The in-house Faz Restaurant offers delicious Mediterranean cuisine, while the Faz Lounge boasts a full bar and happy hour specials.